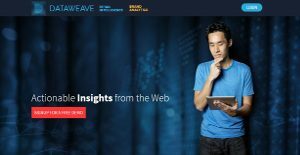 What is DataWeave Brand Analytics? DataWeave Brand Analytics is an automated system that detects and documents product pricing activities by the competition, delivers critical information in real time, monitors online promotions, and controls MAP violations. The software also comes with capabilities to help businesses analyze catalog quality and protect their brand equity overall. With DataWeave Brand Analytics, businesses makes monitoring of their stocks easy and quick. The system also helps users gain critical information about the promotional strategies and discounts offered by competing businesses. The platform also delivers seller analytics to users, enabling them to identify fast moving products, unauthorized sellers, as well as determine the competing brands carried and distributed by their sellers. Its REST APIs allow it to blend within every software infrastructure, while the quote-based pricing scheme ensures every business can grab hands around its functionality. DataWeave Brand Analytics provides brands with near real time information that helps brands to drive Price Parity across channels, analyze sellers on marketplaces, monitor their competing Brands and track promotions online. The software comes with a MAP & Price Monitoring feature designed to monitor the online retail landscape and seek out violations. It also helps brand managers identify unauthorized sellers. Brand managers will also be able to monitor & analyze pricing strategies of brands that they compete with. This module helps brands to be alert to MAP violations of their products online which negatively impacts the brand as well as drive price parity across channels. The Seller Analytics feature provides brands with deep seller insights in a variety of marketplaces, and helps answer key questions needed to guide everyday relationship administration. With it, brands can easily identify unauthorized sellers and analyze competing brands sold by sellers. This functionality also allows businesses to identify new sellers. With DataWeave Brand Analytic, businesses are able to gain insights around product velocity via the momentum analytics module. Key questions like demand indicators at SKU level, product stocks being replenished, product rankings are considered to help you understand the online retail landscape. It becomes easy for business to monitor demand indicators at product level and benchmark brand product placement across retailers. Promotional Insights is designed to give you the promotional advantage you need with accurate, timely and actionable insight. This technology provides an understanding to the overall promotions landscape that will fuel your promotions strategies. With it, businesses are able to analyze promotional strategies of competitor brands; and track Promotions effectiveness and impact of competitor brands promotions. What Problems Will DataWeave Brand Analytics Solve? A client is concerned about the lack of control on the pricing of their products online. DataWeave Brand Analytics worked with them to help them track the MAP violations for their products online. This product helps to identify MAP violations in near real-time and highlights them using alerts. This allows the client to monitor and take action to end these practices. The DataWeave Brand Analytics was able to help the client reduce the number of violations by 60% using our platform. One of the most significant challenges that a brand faces is to ensure the quality of the purchase experience is consistent. The seller of the product has a significant impact on the entire experience. DataWeave Brand Analytics helped one of their clients monitor the sellers across platforms and highlighted unauthorized sellers. The software was able to help the client eliminate 75% of unauthorized sellers and drive more of their product purchases to their authorized sellers. This has helped the client also increase the volume of sales and drive price parity for their online channels. Some clients were interested to understand how their competitors banner promotions were impacting their sales volume on a given ecommerce platform. They benefited from DataWeave Brand Analytics’ approach where the time period of analysis was broken into phases- pre, during, and post promotion. As an outcome of that analysis the clients were able to decipher that the sales volume for the given brand client was impacted about 3-4 days after their competitor started running the banners. DataWeave identified which banners have a higher impact and the profile of these banners. On an average there are clients which get up to 14% increase in traffic and 7% increase in sales. If you are considering DataWeave Brand Analytics it could also be sensible to investigate other subcategories of Best Business Intelligence Software gathered in our database of SaaS software reviews. It's crucial to note that hardly any app in the Business Intelligence Software category will be an ideal solution able to fulfill all the goals of all business types, sizes and industries. It may be a good idea to read a few DataWeave Brand Analytics reviews first as certain software may excel just in a really narrow set of applications or be prepared with a very specific industry in mind. Others might work with a goal of being simple and intuitive and as a result lack complicated features needed by more experienced users. You can also come across services that support a large group of customers and offer a complex feature base, but that in most cases comes at a more significant price of such a software. Make sure you're aware of your requirements so that you choose a solution that has all the features you search for. How Much Does DataWeave Brand Analytics Cost? DataWeave Brand Analytics enterprise pricing information is available only upon request. Contact the company directly for your quote, or ask for more details on their product. We realize that when you make a decision to buy Business Intelligence Software it’s important not only to see how experts evaluate it in their reviews, but also to find out if the real people and companies that buy it are actually satisfied with the product. That’s why we’ve created our behavior-based Customer Satisfaction Algorithm™ that gathers customer reviews, comments and DataWeave Brand Analytics reviews across a wide range of social media sites. The data is then presented in an easy to digest form showing how many people had positive and negative experience with DataWeave Brand Analytics. With that information at hand you should be equipped to make an informed buying decision that you won’t regret. What are DataWeave Brand Analytics pricing details? What integrations are available for DataWeave Brand Analytics? DataWeave Brand Analytics is built on Rest APIs and can integrate with any products/services that can connect with Rest APIs. If you need more information about DataWeave Brand Analytics or you simply have a question let us know what you need and we’ll forward your request directly to the vendor.